* In this method I always able to capture a penny share near it year low and maximum holding limit is 20 shares. 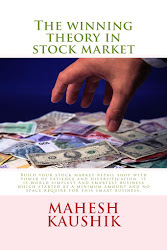 FUNDAMENTALS OF SHEETAL BIO AGRO TECH LTD: - * always remember fundamentals of a penny stock is very week and I try to get trading move in these type of share (I called him scrap shares) but it is not bad to give a look on fundamentals. *Sheetal bio agro tech is a 1 rupee face value share. Basically this is finance company his old name is sheetal securities ltd. Book value of this share is 1.01 year high1.05 and year low 0.41 so I try to buy it near about 0.45-0.48, promoter holding in this share is 4.99 % only, company have no website, in march 2008 this company promoter holding is 0% but now promoter holding is 4.99% so I think something is there. I am not able to see your post on penny stock for this week.Please help me, am I looking at right blog.